I felt a chill, sitting in my little box of a room – tiny, with oddly-placed windows that allow nearly no natural light to shine through. Wrapped up in a pile of heavy blankets and my newly purchased yak wool scarf, trying my best to stay insulated from both the physical cold and the social gatherings outside by these four walls and my ipod headphones. It’s the typical way I put up my defenses and retreat into my shell when I am faced with a difficult situation, with the first signs of depression. My first instinct is to pull myself within, to hide from those who love me or who are concerned, to make myself as small as possible, a stranger to the world outside, to slip through unnnoticed. Call it a defense mechanism, but it’s the way I cope and has been for years. I can’t say that it’s been successful but after many major bouts of clinical depression in my adult life, it’s the only way I know how to survive until I’m ready to push through that darkness. But India seems bent on teaching me that there is nowhere to hide. The love out there is so big, so colorful, so full of richness, so full of light and flavors that it will literally burst through the door, whether I want it to or not. Tonight it came via a stainless steel tray, loaded first with the simplest of flavors – a spiced vegetable curry with tender, sweet carrots, creamy chunks of village potatoes and crisp green bell peppers. 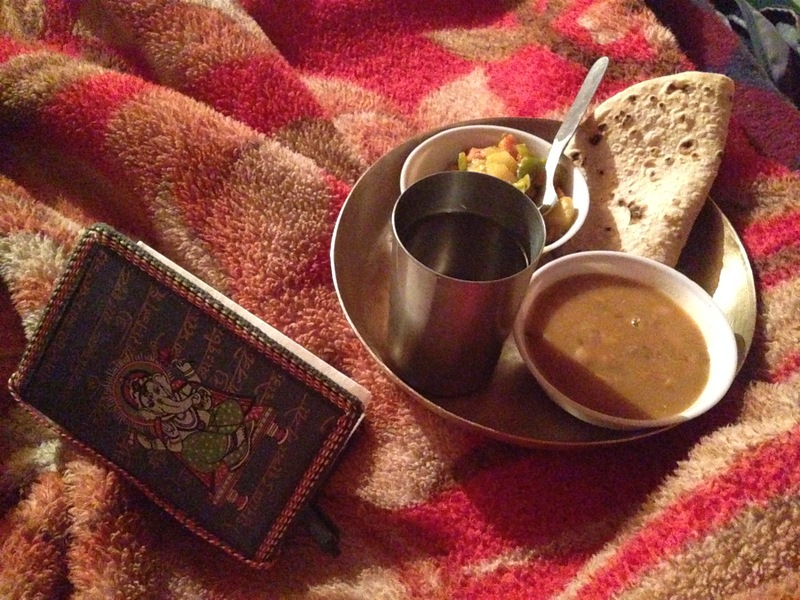 On the side, a simple chapati flatbread and a steel cup of cold water. My first thought (in my wounded state of mind) was that it reminded me of humble prison rations, and I found none of my usual joy or anticipation in bringing the first spoon to my mouth. Yet bite by bite, each spoonful brought me nourishment to my body and revived my spirit. Because I couldn’t refuse in Hindi, another plate soon appeared – rajma made of red kidney beans, not as spicy as the fiery version I’d tried in Amritsar, but obviously made with love and care. Next, a container of rice. As I’d watched others do, I spooned the rajma over the rice and watched as the flavors mixed and deepened with each new taste. I tried to slow down to appreciate the texture and flavor in each bite, to receive the blessing and well wishes being sent to me by the kind woman who prepared them and delivered them to my sick room even as I tried to say no. I loved her then, for ignoring my attempts to shut her out, and to lock myself inside. It wasn’t the first time this trip, and not even the first time that day that I’d been humbled by the kindness of strangers. This morning as our group leader, Krishna, took my bag to carry up the steep steps to our guest house I tried to object since he was carrying not only a huge backpack but another bag in his hands as well. Later, a sharp pain that I’d had for years stopped me from joining the group in a trek and I found myself doubled over in frustration and pain. Yet magically, I listened to one of the other participants, Dr. Pranay (whose name means “love”), explain the remarkable coincidence that he is one of the most respected surgeons in India for exactly this type of surgery! How I cried then, hot tears of relief flooding my cheeks in gratitude for the serendipity that brought me all the way to this remote village in the Himalayas, to this man who may finally be able to help me! How ashamed I felt that earlier in the day I had thought – even said out loud – how “over” India I was… How I was over the loud noises, the touts, the unfamiliar smells and languages, the scams, the crowds. I cried then out of frustration and put up my walls, but now I felt nothing but a deep gratitude that this country has ripped me open in order to teach me that sometimes you need to be vulnerable to accept the love, the nourishment, the support and the kindness and beauty that exists in the world. Then I realized, perhaps India is full of such extremes precisely to make us appreciate the contrasts – the noise of the cities to appreciate the stillness of nature, the nostril-curling stench of the streets to appreciate the warm spices flowing from the kitchen hearth, the frustration of the bad situations to appreciate the kindness of those who genuinely want to help. We booked our 7-day Sangla Trek in the Himalayas with Dark Green Adventures. Check out their Facebook page for their upcoming treks and trips that will help you experience India like a local and on a budget! I was not compensated in any way for this post. Ah, you’re writing heart-filled essays! Yet another way you’re being vulnerable. I can just picture you all snuggled up. Brava, friend! Beautifully said. Serendipity, indeed manifest! Best wishes on your travels. I think of you often and love reading your blogs.